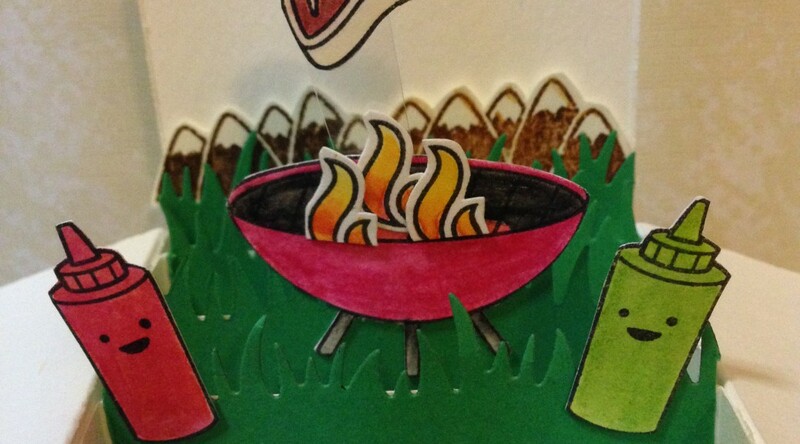 Extra Details: I started by stamping the arrow in pink ink across the top of the card front. I re-inked the stamp with yellow ink, rotated the stamp 180 degrees and overlapped the points just a bit. I repeated the same steps for all found stripes. I offset where the points meet for some interest. Lastly, I cut and adhered four black Thanks die cuts. This was a quick card to put together. I saw this sentiment in a YouTube video a few days ago. I couldn’t wait to use it. Extra Details: I started with a stitched rectangle panel. 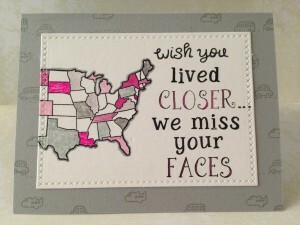 I used part of an existing sentiment and some alpha stamps to create my own custom sentiment. I stamped the outline of the United States on the other edge of the panel. 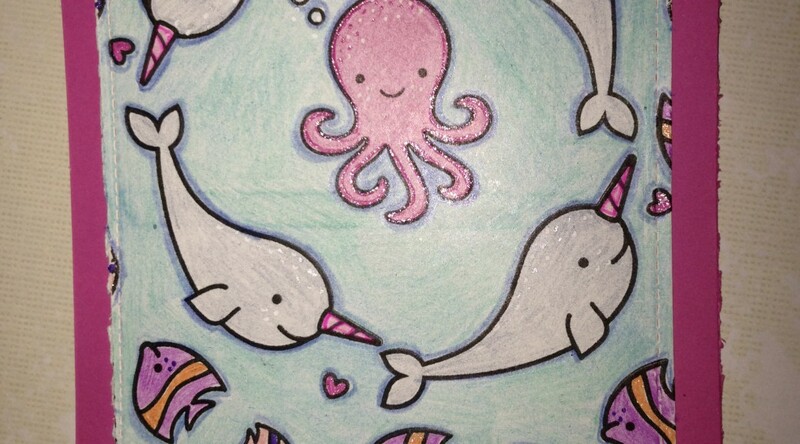 I used glitter gel pens, regular gel pens, and colored pencils to add color to the images. After I completed the panel, I made a card base from gray cardstock. I added some dotted lines and little vehicles in a light gray ink for interest. I adhered the white panel to the card base and the card was done. Extra Details: I started by creating a gray card base. 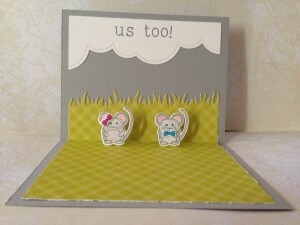 I used Simon Says Stamp Fog Ink and a background stamp to add interest to my card base. 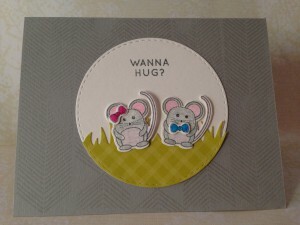 Then I stamped and colored my images; 4 mice and 4 bows. I used colored pencils for the mice and gel pens for the bows. I used the matching dies to cut out the images. While I had my die cut machine out, I also die cut a white circle, some green grass and puffy clouds. I used my new pop up die to make two pop up tabs in the large green grass piece. I adhered the grass and clouds with some tape runner. I added a sentiment to the white circle and the clouds. 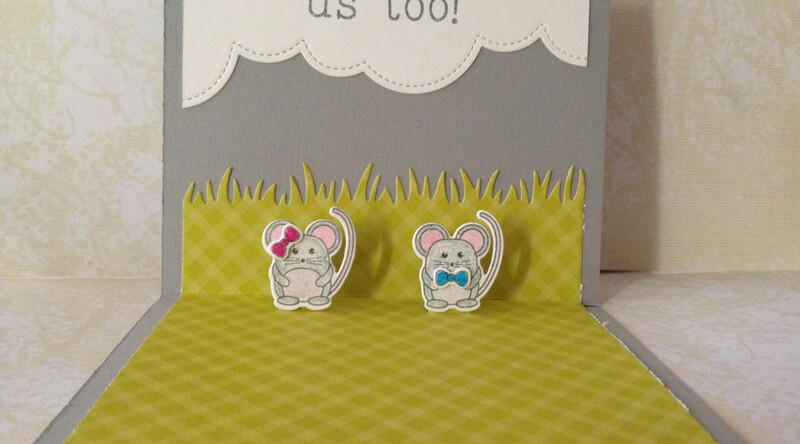 Lastly, I used glue dots to adhere the mice to the front of the card and the pop up tabs on the inside. My father’s birthday is in a few days. 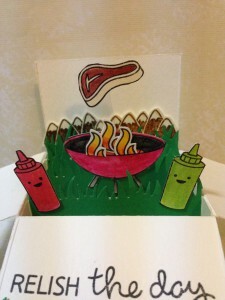 I made a pop-up box card for him. 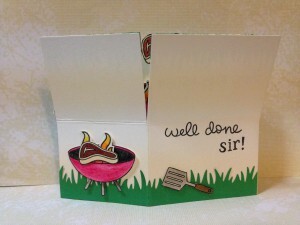 Lawn Fawn just released their new die for this type of card, which I do not own. So I figured out how to make one on my own. I love the way this card turned out. 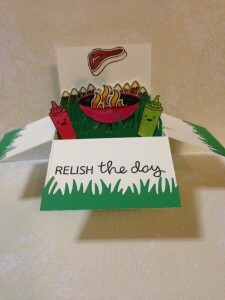 Extra Details: I started by stamping and coloring all of the images for this card. I used Distress Inks and water color pencils to add the color. Once the images were dry, I fussy cut them out. Then, I began work on the card base. I started with an 11.5” by 4.25” strip of heavy card stock. To create the box shape, I scored the strip at 2.5”, 5.5”, 8”, and 11”. To make the pop open feature, I scored the strip the long way at 2.125”. Using my scissors, I cut each short score mark from the top edge of the card to the long score line. I cut the top piece off the small tab at the end of the strip. Using strong double sided tape, I adhered the box together. I cut three small strips of the same card stock to the make the braces for the inside. They were 1” by 4”. I scored each brace ½” from each end. I used these tabs to adhered the braces to the inside of the box. I die cut some green card stock with the Grassy Border Die, which I used to decorate the bottom of the card, each panel and the three braces. I added the images with glue dots. Lastly I added my stamping and the card was done. I was looking through my stamps and decided to have fun with a background stamp. 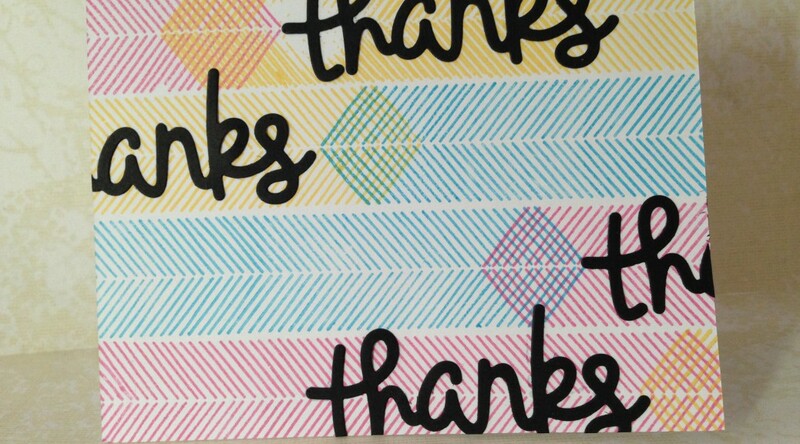 Extra Details: I started by stamping the chevron strips on the card base. I overlapped the colors to get them to mix a bit. Once, I was done with the rainbow colors, I finished the design in gray. I stamped the frame on a scrap of card stock. 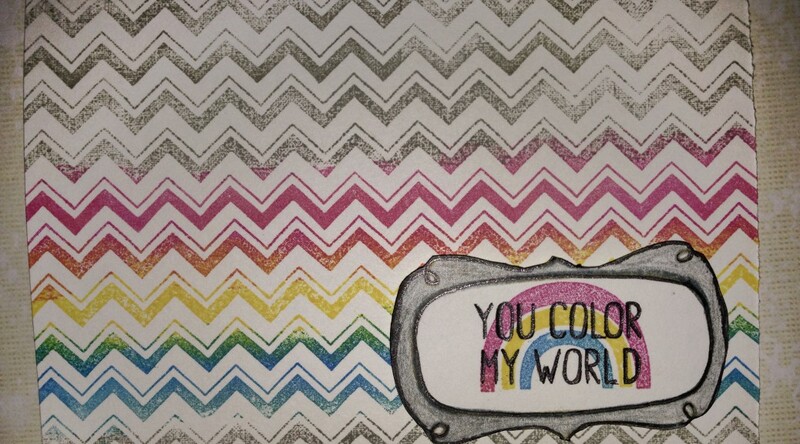 I used colored pencils to color it in and added the rainbow and sentiment. I fussy cut out the frame and adhered it to my card base. 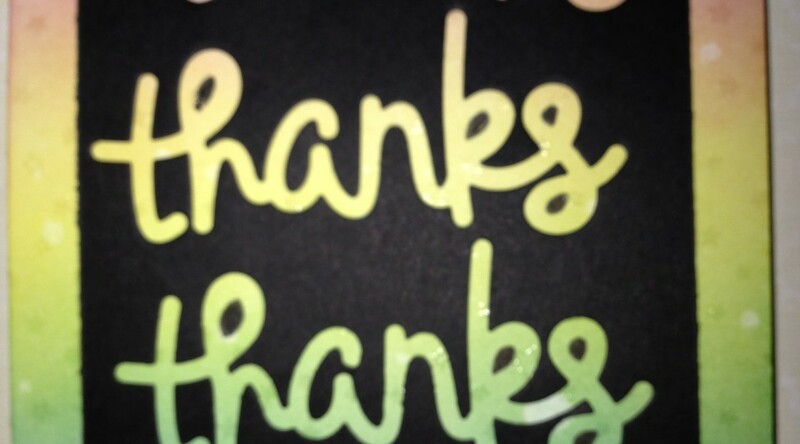 I had a scrap of black card stock that I had die cut the work thanks from a bunch of times. It looked so cool that I couldn’t throw it out. So I made it into a card. Extra Details: I started with the die cut scrap. I trimmed it down a bit so it looked neat and centered. Then I created a card base. 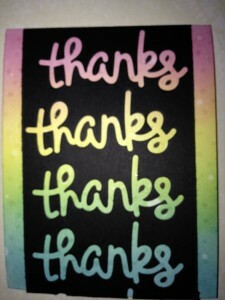 Using Distress Inks, I ink blended a rainbow background on the front of the card base. I stamped and clear embossed the Starry Backdrop stars. Then I added some water splatter to add some more texture. I adhered the die cut piece to the card base. I did not keep all of the little inner pieces of the letters, so I drew them in with a black marker. Then the card was done. 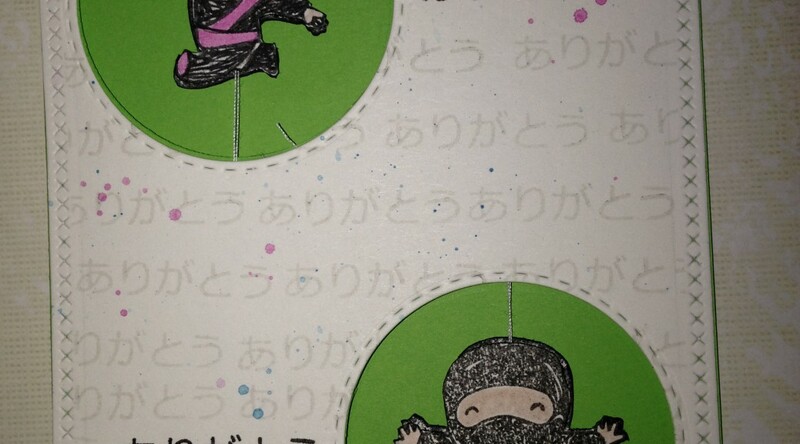 I needed to send a thank you card to my nephew, so I pulled out the Tiny Ninja stamp set. Once I had the ninjas stamped and cut out I could resist making a spinner card. 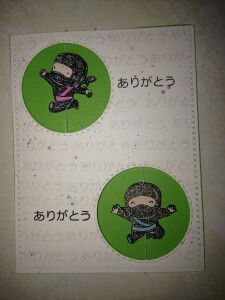 Extra Details: I started by stamping and water coloring my ninja images. I used Distress Inks as water color. Once the ink was dry, I fussy cut the ninjas out. 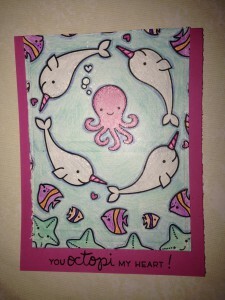 Then, I decided to make a spinner card, so I had more stamping and coloring to do. One of the ninjas is a mirror image of another stamp so that one was easy. For the other ninja, I found a mirror stamping tutorial online and followed it. I die cut an A2 sized panel for my card front. I die two small stitched circles from the panel. 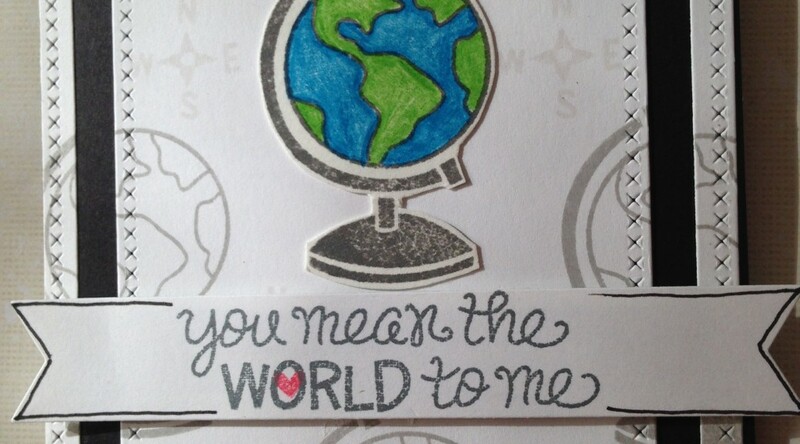 I stamped the sentiment next to the circles in black ink. 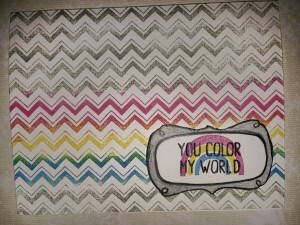 I used the same stamp to fill in the background but with a light gray ink. I added some splatters of the Distress Inks I used to water color the ninjas with. Once the panel was dry, I lined up the panel with a green card base and die cut the circles again. Using a strong glue, a sandwich some thread between the ninjas. Once that was dry, I assembled the card. I adhered the ends of the thread between the card base and the stamped panel. Going through my box of pre-colored and cut images, I found this globe. It inspired me to make a card. 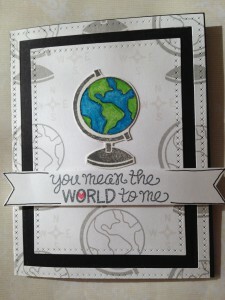 Extra Details: I started by stamping my background design with the globes in a gray ink. Once done with the globes, I filled in some of the blank space with the compass roses in a very light gray ink. At this point, I noticed that the design was off center. GRRRRR… so I die cut the stamped panel up. I used a large cross stitched rectangle and a smaller rectangle die for the outer frame. I used a smaller rectangle die to cut the inner panel. I centered the stamped images as best I could while cutting the inner panel. I adhered the frame and panel to a black card base. I attached the colored globe over the top of a stamped globe. 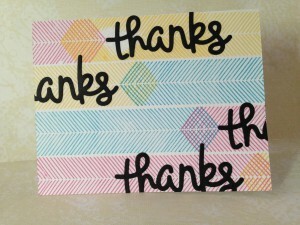 I stamped the sentiment on a scrap of white cardstock and die cut it with a banner die. 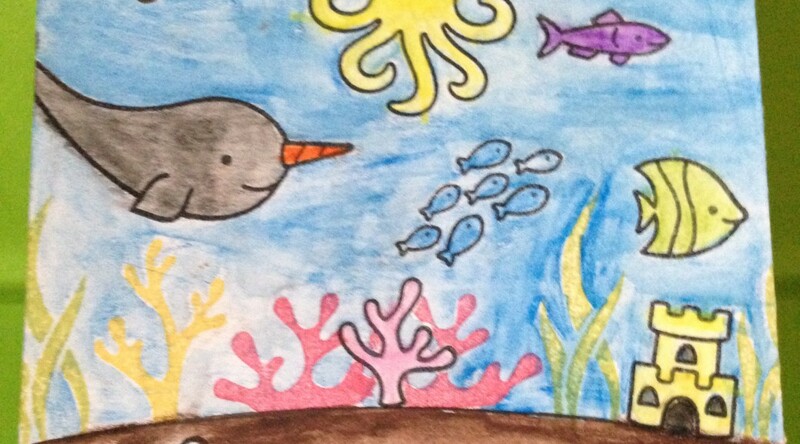 I added a hand drawn out line to the banner to help it stand out. Once I adhered the banner, the card was done. I had fun making a Valentine card today. Extra Details: I started with a 4.25 x 5.5 panel of white card stock. I stamped all of the images in circular pattern. I did not measure anything or really plan anything out, so of course I stamped the octopus not in the center of the panel. 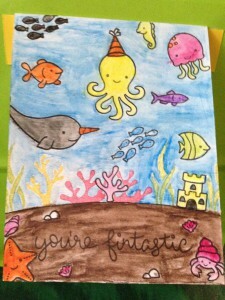 I used colored pencils and glitter gel pens to add color to all the images. To compensate for my stamping, I die cut the panel and adhered it to a pink card base. 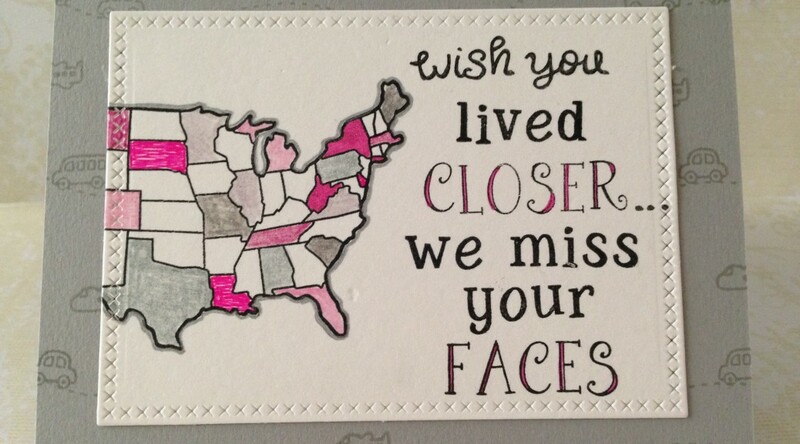 I added the sentiment and the card was done.